Are you sick of swiping, chatting and never actually going on any real dates? HowAboutWe is an app that cuts right to organizing your first date. It aims to replace the relentless swiping and message habit by facilitating access to impromptu, real-life dates. HowAboutWe is actually a five year old dating service that was acquired by IAC last year and relaunched this week with a totally revamped app. Interestingly, IAC is the parent company to Tinder and Match.com, so it is no secret that it is taking its position at the top of the online dating game seriously. Tell the app you’re up for a date, and the new Tonight feature instantly provides you with a list of matches who are also available. If you like one of the proposed guys or gals, it will send you both an introductory message and suggest that you arrange your date. It’s this feature that differentiates the app from the rest – instead of promoting in-app messaging for prolonged periods of time, HowAboutWe encourages you to get offline and interact with these people face to face. On a personal level, I think that sounds like a breath of fresh air. Far too many people are stuck on Tinder or other dating apps at events, instead of actually getting to know each other. The idea of meeting someone face to face without messaging them to find out their favorite colour will seem daunting to some, but HowAboutWe pulls in user info like how you’d spend an ideal Sunday afternoon, what you’d do if you won the lottery, and even whether or not you have or want children, so you will have an insight into someone’s lifestyle and personality prior to meeting them. 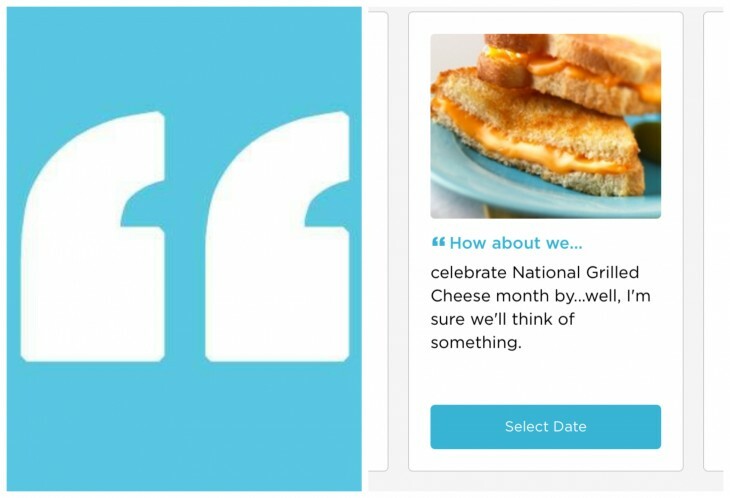 When you sign up for HowAboutWe, the app asks you to share what you would like to do on a first date, as well as the usual info (age, location, orientation, etc). I played it safe and said “Get a coffee,” but the suggested options were much more creative. As well as the Tonight option, you can use the Connections feature to receive five fresh matches daily or check out the Pool, which is pretty much the same as Tinder. There’s also a powerful search with category filters to help find an ideal date. You could argue that having Pool as an option is a total contradiction of what the app stands for, but it still turns up accurate matches so it’s not a stab in the dark, or a case of just judging someone on their profile photo. HowAboutWe is a fun, and perhaps more effective way of finding your next date. It gives you a much more creative way to express your personality and even if your date doesn’t end up being “the one,” you’re sure to enjoy the actual activity you’ve matched over anyway. So, if your Friday night is looking a little quiet, maybe HowAboutWe can liven it up.